I have recently purchased my very own WMMT 3DX+ cabinet for my private collection and use. My machine was/is not in the greatest condition as bought, however I have done alot of work on reverse engineering the components to replace parts as cheaply as possible. Please feel free to add any knowledge you may have or correct me. The System that runs WMMT3/DX/+ is called the Namco system N2. The CPU is an AMD Athlon socket A / 462 type. My original one was specifically an AMD Athlon XP-M 2800+ which was AMDs MOBILE CPU range. I have test fitted an AMD Athlon XP 3200+ to the Mobo and it worked extremely well. Load times were about 4x faster HOWEVER due to this CPU being for a desktop device after about 10-15 minutes of running the game crashes and resets. I believe this is due to the standard power supply unit not being sufficient for the extra power required for the desktop CPU. My unit also came with 2 security dongles that are REQUIRED to boot the game and are unique to the hard drive serial. They contain a program called HASP V0.06 that is anti piracy security lock software. Along with these above components we have less critical ones, such as the sound card setup, which is a simple 5.1 with red and white AUX output that runs to the sound PCB. There is a connection port for the I/O boards next to the USB / Ethernet ports which connects up all the input devices such as the Steering assembly, card reader and shifter. As I find out more about the machine I will be sure to update this article. THANKS! Tried contacting the respective companies for those items? Cabbie, On my personal machine I have replaced the RAM with 2 new 1GB sticks and I have a new AMD socket 462 CPU on the way (both items are readily available from ebay suppliers). The only thing at this stage that im unsure about is the actual motherboard product number which would point me to the manufacturer. As I post this I have managed to get the game running stable again without crashes with full use of the card reader as well. It does still have itermitant lag issues which im hoping will be fixed by a fresh CPU. Very interesting read. What im assuming is, that the files written to the UK distributed HDDs are different to the japanese ones and dont require the Nvidia motherboards BIOS booting kernel to start the game maybe. What version of WMMT3DX+ cab did you get? Vash, my machine is from Japan (I am in Australia) but it has the english international version of 3DX+ hard drive installed. As far as the Cabs go all the WMMT 3/DX/+ are the same, they just have different Hard drives and USB dongles installed. In regards to the UK version I would love if someone could take some internal photos of a UK Cab version to see the difference. The Initial D Version 1 / 2 / 3 cards will work on Max Tune though the card will turn full black as the card was never made to have print rewritten physically as it used heat to add physical print to IDAS 1-3 cards. The same can be said for Derby Owners Club cards as well since it uses the same card system as IDAS 1-3. Mario Kart 1-2 cards are similar to Max Tune 1 / 2 so its obvious those work as well. I am actually in the process of getting my own machine though I am working on trying to find some HDD and Dongles for 3DX+ English / Japanese as well as MT3 Eng / JP. As the machine I am planning on getting only has 3DX Eng currently. Not just that, I liked MT3 cause of its revamped feel compared to 1-2. Also the Official Machine Time Attack allows you to just make a card and have a full tuned car to go. just a guess, i don't really have experience with these things. Hiw will the connection to be able to use your old discarded vehicle datas going to work? Dont you need the updates and software updates from NAMCO to be able to play? It is unless you still have the old discards from 3. Rebuilding the machines entails actually having a FRESH system. So you still need the files and official licensing from Namco. Pull this off...You will be my idol and personal hero. I love your passion to restore. I have a bunch of brand new blank cards that I just recycle nto new cards after they become discards. I have all the files backed up to a Linux computer (this is for the long time upkeep of my own machine) but the REAL challenge is working out the BOOT firmware on the BIOS. untill this is replicated we wont be able to use any other chipsets to run the game which worries me for the long term because these chipsets are OLD and have had a hard life. As for versions, the versions are specific to the hard drive you have. When they upgraded to DX / + they simply replaced the hard drive with the new "version" and new USB dongle. I have managed to grind out hours of story mode, 10 out run, time attack & ghost battles without any problems! I guess NAMCO really did a lot of hard-coding in that area, but isn't there an emulator for the System N2? There are emulators for Sega's NAOMI that run IDAS. Vash you are exactly right the AMDs do run very hot! The N2 is a really loud system too. The game will probably get run on average about 10 - 15 hours a week which is nowhere near the abuse they got from arcade use. 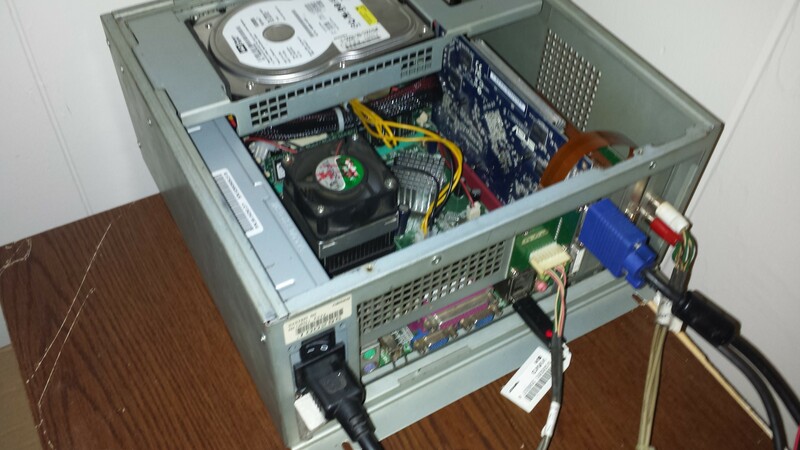 I do still want to upgrade to power supply unit in the future to see if I can get the AMD Athlon XP 3200+ running stable. -Antares, there is nothing to emulate, the N2 is a PC running Linux essentially. What needs to be done is the BIOS BOOT firmware needs to be somehow downloaded and decoded. The Video card in my machine was thankfully replaced when they did the 3DX+ HDD install (it has an install date taped to it) so hopefully this will last a long time. The display is currently 100% no dead pixels no colour fading or burned image (which I was very surprised!) i will post up a few pics of my machine soon so you guys can see the ins and outs of it. From someone I have talked to the video card is a Nvidia 7600GS 256MB card, though you cannot just pop in one you would have to flash the BIOS on the card itself with some special Namco BIOS in order for it to run on the system. From what the person told me if you try to install the 512MB version it will artifact or something but the 256MB version seems to be the one the machine will work perfectly with. The game runs perfectly fine with this video card in it, though I haven't tried any other versions in it. Image size reduced, original size: 4128 x 2322. Click here to view the image in its original dimension. Antares, there is nothing to emulate, the N2 is a PC running Linux essentially. What needs to be done is the BIOS BOOT firmware needs to be somehow downloaded and decoded. Ohh, thanks for that. I was assuming the N2 is a platform like NAOMI, didn't realize it was referring to the entire machine. As for the machine, I don't think it's gonna be encountering issues unless cooling becomes a problem. Speaking of which, given the amount of processing the system does, what kind of ventilation/cooling does it have? I'm curious as to how these things run for an entire day at arcades of varying temperatures and still keep on going. Hey mate sorry for the late reply I have been away! The cooling is 2 main fans and a CPU fan. if you ask me, these were NOT designed to last especially since they almost all were run in high heat areas such as cramped arcades. Its like they put the absolute minimum to keep them running for 3-5 years of hard use. For home use the setup is completely fine in a well ventilated room.